I have always had mixed feelings concerning militant music that has its roots in either religion or nationalism. 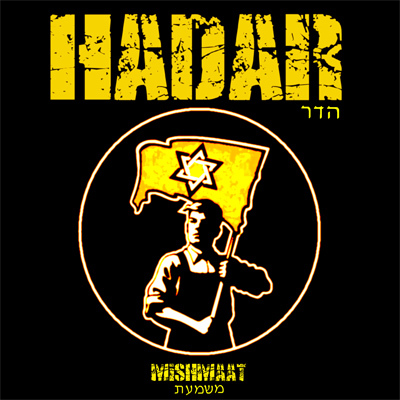 While I share the same heritage, loosely, with Na’ama Bat-Sarah who operates HADAR, I believe we wouldn’t have too much to agree about in an imagined conversation we might have about ideology. I find it somewhat funny that more often than not, the writer of the text about the particular album in this militant genre will suggest that “while I might not agree with the views”, the album is such and such. The relationship between the agenda and the music works in one way only. While the agenda, without doubt, shapes the music, the music should then stand independent with no direct connection to the frame of mind that created it, as this breaking of the musical heredity is what allows an evolution to come with time. I am not writing this in order to renounce whatever idea that is behind this or any other politically charged album, as I happen to like these albums a lot. I do this in order to separate these two elements while I understand the album I am listening to. Among the thundering martial drums we can also hear intense, trumpeting declarations that help the music move boldly like a determined cannonball. Bat-Sarah also adds guitar playing that brings an exotic touch to the music. Mishma’at is not only an instrumental album, and we also have few songs in it that are pretty good. KadoshVrah is my favorite part of the album, combining many elements from all over the album into one great song, both painful and determined. This intense song comes before the majestic closure of ” Hinkhaltanu K’vod”, which ends the album with glorious thunders and hymns. Another great moment is the track “BMdbar”, an endless (well, over 12 minutes) dirge – like movement which lays beautiful, touching layers together and gains power as minutes pass. This long journey begins hopeless and ends determined and victorious, yielding to “Barzel Shalem”, which marks the end of the previous track with the fine blend of grim loops and semi oriental melodies. Mishma’at holds both gentle and fierce moments, which are combined, sometimes within the same track. Na’ama Bat-Sarah shows both compassion and the power and determination to stand proud and loud. Sometimes that’s all you really need, really. Give it a listen.